Over twenty years ago, four men, prompted by their own life experiences, came together and created a company based upon some very basic principles. First, they wanted a company dedicated to health. They also wanted products that could stand up to the highest standards and expectations. Then they wanted to make these products available to everyone and, most importantly, they wanted the company to become known for its product integrity. In 1992, the passion, the unique contributions of each partner, and years of hard work crystallized in the creation of Life Plus. Seeking the most effective distribution method, the four chose Referral Marketing as the vehicle to distribute their cutting edge nutritional products. Today, these principles are why Life Plus offers nutritional supplements that stand alone in the industry including products for Vegetarians. 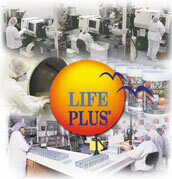 Click here now, go to our Nutreeplus nutritional supplements product listing section to review Life Plus' products!!! Overall wellness is easily gained with our Nourish, Cleanse, Protect and Support philosophy. A well-nourished body has the advantage of maintaining overall health because the cells, where healthy "body building" truly begins, are supplied with adequate nutrition that allows them to perform their specific functions. Cleansing eliminates waste all the way to the cellular level and provides a new beginning for nutrients to be absorbed and used properly. I suggest that you try Paracleanse for this task. Protecting new cells with adequate antioxidants and nutritional compounds improves the chances for each cell to be more energized and invigorated, or full of life. Life Plus Daily Biobasics and Proanthenols are essential components for beginning your nutritional health program. However, while many of our nutritional needs are the same, each person's body is different. Each Life Plus nutritional supplement product supports healthy body functions and structure of specific organs or body systems. Because of its parent company V & M Nutri which was created in 1936, Life Plus has evolved with over fifty years of experience manufacturing "doctor quality" cutting edge nutritional supplement products. We only use the highest quality materials which are as natural as possible. Products are formulated in the most synergistic way to provide optimum nutritional results. Because most of our products are manufactured in-house, they can guarantee potency and quality and provide them to you at economical realistic prices. Daily Biobasics is our great foundational nutritional supplement product and it is found in our general nutrition care section of our product listing area. It gives your body the complete and comprehensive daily nutrients it needs to help boost energy levels, enhances circulation, and provides the essential vitamins and minerals needed on a daily basis. 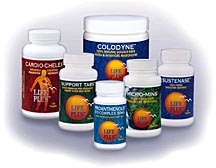 Click here now, go to our Nutreeplus nutritional supplements product listing section to review Life Plus' products!!! Life Plus International uses only the finest ingredients possible to manufacture the best, doctor quality, pharmaceutical grade products. Their ingredients are as natural as possible and are obtained from sources all over the world. In most cases they are 100% natural. However, certain ingredients, due to quality, processing characteristics and reliability of both potency and supply, can be enhanced by substances that are synthesized in the laboratory. Most people find it advisable to take nutritional supplements. Where else are you going to obtain the nutrients you need to support optimum health if you aren't eating a varied diet that provides them? Most people know this intuitively, but they simple don't know what supplements to take. This is one reason the Life Plus Nutritional Supplement Philosophy was established. At Life Plus the focus is on quality. Using state-of-art facilities, they produce the highest quality products utilizing modern processing methods. Their products are manufactured to strict specifications using cold processing whenever possible. Be aware of misleading promotional tactics used by some competitors. At times they quote "Material Safety Data Sheets" (MSDS) about ingredients in cosmetic-type products to attempt to discredit certain materials in ours or another company's products. Most companies like this are interest only in their profit rather than the quality of their products. Heat destroys enzyme and vitamin activity. To prevent this from happening, Life Plus uses Cold Processing, which retains the potency of these nutrients, so their true value can be optimized. Cold Processing is just another of the innovative tools Life Plus uses to ensure their products are the highest quality they can make. They never compromise on quality which is why they manufacture virtually all their products in Batesville, Arkansas, USA, home of Life Plus International, where they can monitor the entire process. The exceptionally high-quality of Life Plus products is the result of paying special attention to even the tiniest details. Their quality-focused approach starts with inspecting raw materials and continues throughout the production process. Decades of experiencing formulating, manufacturing, bottling, labelling and shipping products enables them to guarantee the utmost quality at a fair price-from start to finish. For many years, these high-quality products were only available to doctors and physicians. The Research and Development Department at Life Plus is a highly qualified team led by DR. McKee and Mr. Lemon. They are committed to continuously reviewing and reformulating products according to the latest scientific experience.